On occasion, we are asked why the ingredients in the Adrenal Protocol supplements used in Dr. Wilson’s Program for Adrenal Fatigue and Stress are not all the same as the nutrients, nutritional supplements and herbs Dr. Wilson recommended in his book Adrenal Fatigue: The 21st Century Stress Syndrome. In chapters 15 and 16 of Adrenal Fatigue: Adrenal Fatigue: The 21st Century Stress Syndrome, Dr. Wilson discusses some of the benefits of specific nutrients, herbs and adrenal cell extracts for people experiencing adrenal fatigue. After the book was published, Dr. Wilson focused on bringing those diverse elements into a supplement program that was both more effective and easier to manage than what he had described in the book. 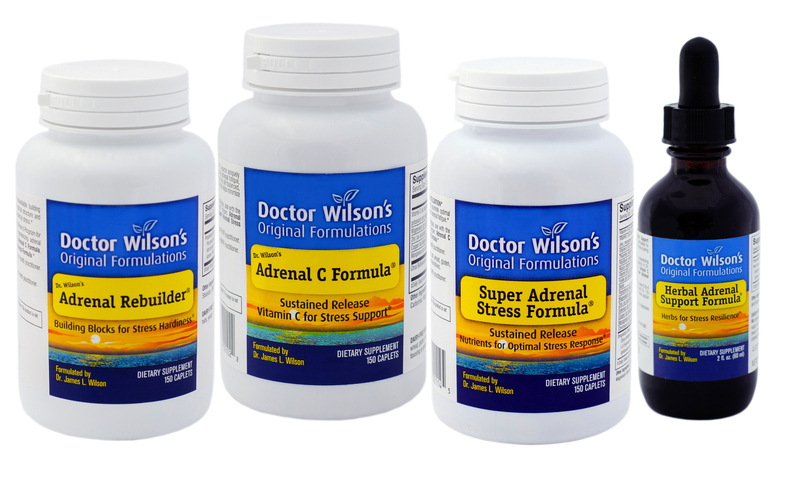 The result is the Adrenal Fatigue Protocol from Doctor Wilson’s Original Formulations, which consists of four unique products that form the dietary supplement core of Dr. Wilson’s Program for Adrenal Fatigue and Stress. Although many of the individual substances covered in the book are contained in these four supplements, there are differences resulting from further research, technical advances in formulating, streamlining to achieve the greatest benefit, and supplement unit capacity. Some ingredients, such as pantothenic acid (vitamin B5 or d-calcium pantothenate), occur in slightly smaller quantities than mentioned in the book. As an innovative formulator, Dr. Wilson was able to combine particular forms and ratios of the nutrients so they would interact synergistically to increase their activity and availability in the body – thus achieving the same beneficial results with less of certain ingredients and making room for other important ones. In the case of a few other ingredients, such as vitamin E, magnesium and iodine (kelp), the quantities in the Adrenal Protocol are the amounts needed to effectively support adrenal function and adrenal hormone production but not necessarily the amounts required daily for the whole body. In formulating, the goal is to create the supplement that most effectively produces the specific results desired. The capacity limitation that determines how much can be put into each supplement unit – whether it is a tablet, capsule, liquid or powder – means that every ingredient had to be carefully chosen for optimum effect and its ability to support the adrenal glands and the stressed body. Partly for this reason, substances in the book, such as calcium, vitamin B12, molybdenum, Korean ginseng, ginger and gingko, are not included in the Adrenal Protocol. Calcium is best taken as an individual calcium citrate supplement because the recommended amount is higher than can be practically contained in a mixed ingredient supplement. It is most useful for stressed people who have that “wired and tired” feeling. Vitamin B12 and molybdenum are also best taken individually because they are absorbed so much better in specific forms – sublingual for B12 and liquid trace mineral complex for molybdenum. Korean ginseng, ginger and gingko were not included in Herbal Adrenal Support Formula because Dr. Wilson found that using all seven herbs diluted the potency that could be achieved, lessening the formula’s effectiveness. He chose to use the four herbs that specifically balance the HPA (Hypothalamus-Pituitary-Adrenal) axis and support the adrenals in order to create the best product. However, Korean ginseng, ginger and gingko can be beneficial for people experiencing stress and adrenal fatigue and may be taken separately, if desired. Ginger and gingko are included in Adrenal POWER Powder, the powdered drink supplement Dr. Wilson formulated as an additional supplement for energy and adrenal health. There are also some ingredients in the Adrenal Protocol that were not mentioned in the book. The most significant of these are the dried glandular extracts that compose Adrenal Rebuilder. In the book, Dr. Wilson discusses adrenal extracts which were available at the time, but after the book was published, he began working on a more complete glandular formula. He found that a combination of dried, hormone-free extracts from the adrenal, hypothalamus, pituitary and gonad glands was much more powerful and beneficial to fatigued adrenals and stress-depleted bodies than adrenal liquid or dried extracts alone. Since the Adrenal Fatigue Protocol became available, thousands of people have benefited tremendously from Dr. Wilson’s formulas. Every day we get calls from people who have experienced very positive changes since they started using these products and following Dr. Wilson’s Program for Adrenal Fatigue and Stress. At every medical conference where Dr. Wilson lectures, other healthcare providers personally thank him and tell him that these products and program work better than anything else they have ever tried with their patients. It continues to be Dr. Wilson’s goal as a formulator to create the most clinically effective products.